Social media management software is specialized software to manage multiple accounts across multiple platforms. G2Crowd now has a social media management software overview to show which tools are leaders in the market, and what their customer satisfaction rating is, among other things. We posted about G2Crowd’s email marketing software reviews earlier this year. 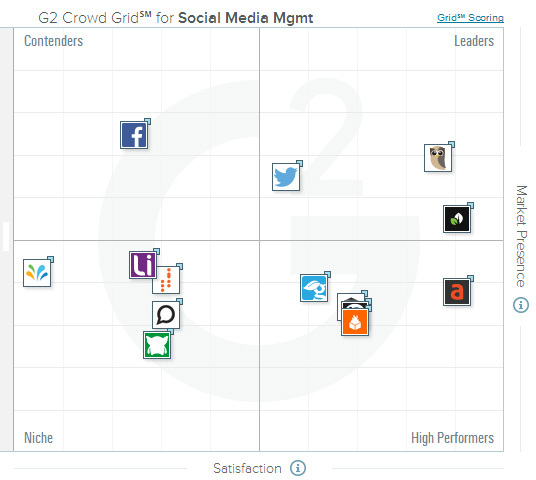 As you can see, Hootsuite is in the top right of the Grid in the Leaders quadrant. Also included is Sprout Social and Tweetdeck. High performers are AgoraPulse, Viralheat, GroSocial, Buffer and Sendible. Facebook sits in the Contenders Quadrant, while the five remaining social media management software tools include Sprinklr, Gremln, Lithium, Spredfast and Shoutlet. Left out are tools that offer a lot more than just social media management. Think of the larger, more full-fledged platforms like Hubspot, Salesforce Marketing Cloud (formerly ExactTarget) and others which offer many more marketing channels and tools including email marketing, marketing automation, CRM, SEO, blogging and others. For a social media management software overview though, the grid and list is pretty complete. Here’s the rundown on the numbers. Included are the number of ratings, the average satisfaction, the market presence and the G2 score. Personally, I’ve been using Hootsuite for quite some time now. Their mobile app has recently been revamped and has a fresher, tighter look and feel. Read more details about the social media management software overview at the G2 Crowd site, or download the research report.